To eliminate a number of factors that would complicate the analysis, I focused only on transfer students and I chose to exclude Running Start students. I mention this at the outset to acknowledge that the results might look very different if non-transfer students and/or Running Start were included. Both of those categories should also be part of a conversation about equity, but for this first look I wanted to keep things as simple as possible. 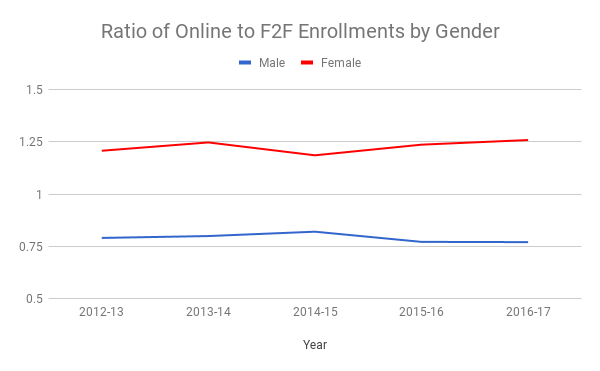 What’s apparent when comparing this chart to the one above is that the general trends are nearly identical in both, but that White enrollments make up a higher percentage of total enrollments in online courses (55.2%) than they do in face-to-face courses (50.3%). While that’s not a huge difference, it seems like something worth exploring further. 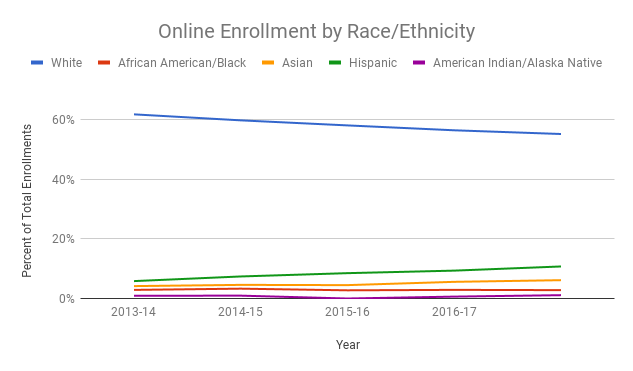 My next step was to consider whether particular racial/ethnic groups appear to be over- or underrepresented in online courses, relative to enrollments in face-to-face classes. 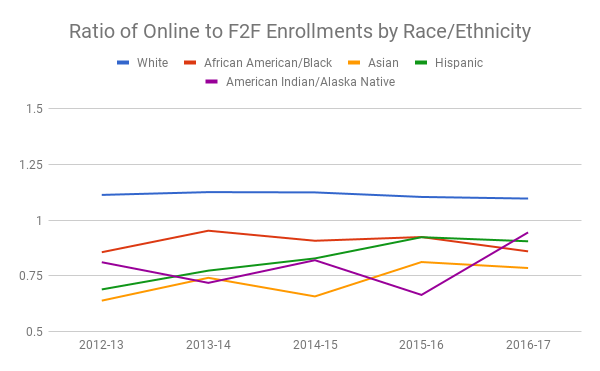 I calculated the ratio of online to face-to-face enrollments, looking once again at the same racial/ethnic categories. This provides another way to see whether there are patterns that might suggest inequities related to online and distance learning environments. This chart deserves a little explanation. 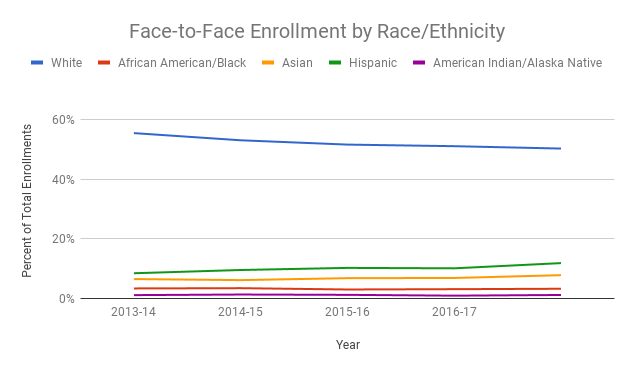 Essentially, if the ratio of online to face-to-face enrollments equals 1, then the percentage of enrollments for a given racial/ethnic category are the same in both course modes. That doesn’t mean the total number of enrollments are the same. It just means that demographic group accounts for the same percentage of total enrollments in both course modes. For example: let’s say we have 100 enrollments in face-to-face courses, and 10 of them are African American. Let’s also say we have only 50 enrollments in online courses, 5 of which are African American. If that were true, African American students would account for 10% of the enrollments in both course modes, giving us an online to face-to-face ratio of exactly 1. But if only 3 out 50 enrollments in online courses were African American, then the ratio would be just 0.6. That looks pretty good, right? 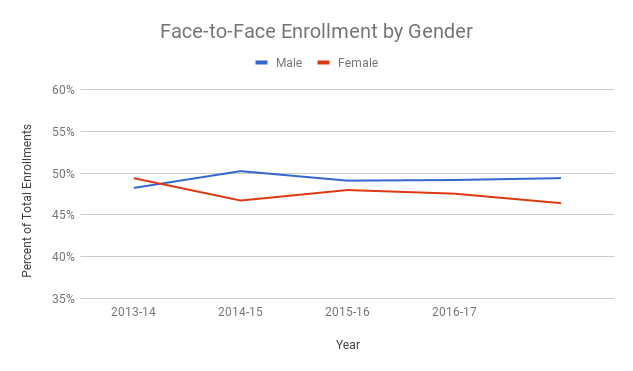 Males account for more enrollments than females, but not by a huge margin. If explored further, each of these conjectures has the potential to reveal sources of inequity. Of course, just because differences exist does not mean they are inherently inequitable. 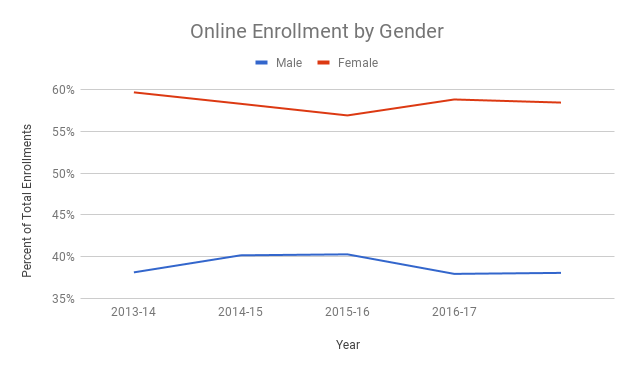 There’s nothing wrong with women choosing to enroll in online courses at higher rates than men — provided that is, in fact, an intentional choice. But it’s another matter entirely if these differences are the product of systemic disparities (e.g., programs that enroll men don’t offer enough online courses) or lack of aspiration (e.g., men don’t think they can succeed in online learning environments), to list just two possibilities. And these same types of questions could also be applied to the differences in online enrollments among various racial/ethnic categories, or even among groups identified by other characteristics (military veterans, first-generation students, disabled students). All of which is to say that this initial foray into eLearning enrollment data has whetted my appetite to look more closely at some of these questions. If you have thoughts about equity in eLearning, or want to join me in exploring this topic, join the conversation in the discussion below. Next Post What Words Appear Most Frequently in Our Course Learning Objectives?